UFC writer, ANDREW MCENALLAY, provides his UFC tips & analysis for Monday’s event, with top heavyweights going head to head for a potential title shot! Analysis: One of the Heavyweight divisions most exciting fighters will be welcomed back with open arms as he steps into the Octagon fresh off a Rd 1 TKO victory against Curtis Blaydes at Fight Night 141. 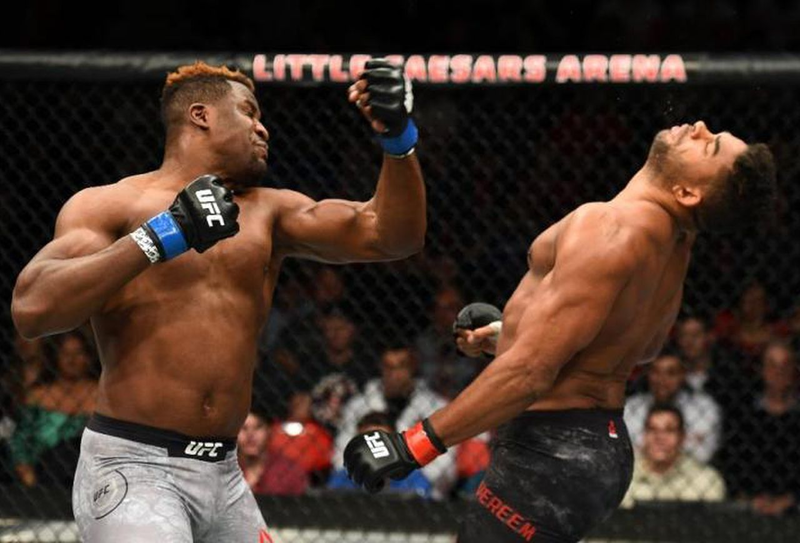 Ngannou was once touted as a genuine title contender until he was completely outclassed in a title fight by Stipe Miocic and then defeated by Derrick Lewis in what was an incredibly underwhelming fight. Ngannou holds devastating power in his hands. It’s impossible to look past his spectacular KO record although there are questions over his ground game. Miocic was able to expose his limitations on the mat as he grappled his way to a UD victory and Velasquez will be looking to do the same. The burning question remains – what kind of shape will we see Velasquez in after a 2.5 year layoff? At 36 years old and a career plagued by injuries one certainly can’t blamed for thinking he is past his best. Analysis: The co-main event is serving up two fighters that are near impossible to seperate as both Vick & Felder have opened at $1.90 a piece in the H2H market. In his last fight, James Vick found himself on the wrong end of a booming brutal overhand right from Justin Gaethje resulting in a Rd 1 KO. After just the one loss from his last five fights, Vick will be looking to make a statement to try and solidify his position as a top 10 contender. Expect a stand up battle with Vick taking advantage of the 6″ reach mismatch. Analysis: On paper, Cynthia Calvillo looks to be the more well rounded fighter than her higher ranked opponent. Averaging two takedowns per fight, Calvillo has been able to made a name for herself after dominating majority of her opponents on the mat with her most notable victory against Bothelo coming by way of submission. On the other hand, Casey is the more active fighter and will look to utilise her reach advantage to negate the superior wrestling of her opponent. Casey’s takedown defence will be put to the test, although Calvillo should be able to break through and get her to the ground as the fight goes on. Analysis: Hailing from the famed Gracie family, Kron Gracie makes his UFC debut up against Alex “Bruce Leeroy” Cacares. Cacares certainly is an unorthodox striker with great movement which he’ll be relying on heavily against a superior grappler. Although he has 11 losses to his name, Cacares is a dangerous fighter with proven KO power. On the other hand, Gracie is a cardio machine who is effective in the clinch until he get can get his opponents to the mat and let his BJJ black belt do the talking. His previous victory was a BJJ masterclass coming by way of rear naked choke and he is very likely to repeat that performance against Cacares despite the two year layoff. Analysis: Two powerful strikers go head to head with both men boasting incredible knockout records so far in their professional careers. Even more so for Luque, the only was is up. He boasts impressive victories over Chad Laprise & Niko Price along with a spectacular knockout against Jalin Turner in his last fight. By adding another KO to his belt, he’ll put his name in the mix for some of the more recognised names within the Welterweight division. While Luque is the firm $1.27 favourite, Barberena possesses damaging power and you have to look no further than his previous performance against Ellenberger to know he is a threat. Although Barberena is every chance of finding a way through for a KO, expect Luque to get the job done. Analysis: To kick off the main card we have Fili and Jury who are both looking to bounce back after losses in their previous outings. Fili has faced some of the toughest fighters in the UFC and consequently paid the price. He has lost to big names like Holloway, Rodriguez and Johnson and as a result has been unable to solidify his status as a top contender in the Featherweight division. Meanwhile Jury finds himself in the same situation. A dangerous striker with incredible defence, he has been unable to get past names like Cerrone, Mendes Oliveira to finally stake his claim as a contender. Although Jury is the firm $1.54 favourite, Fili has great cardio mixed in with effective striking and can hold his own on the mat. As a result, expect Fili to cause an upset.